An organic Italian white made with ripe, hand-picked grapes from south-facing vineyards. 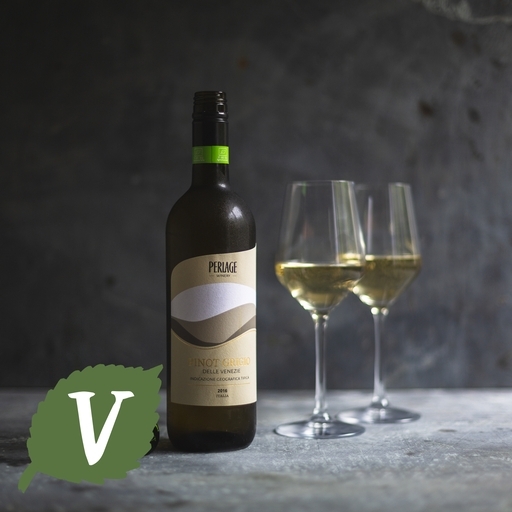 Velvety smooth on the palate, it has luscious peach and pear flavours without losing the crisp dryness that makes Pinot Grigio such a favourite. Try with a simple smoked salmon starter, soup or subtly spiced fish. Get 5% off when you buy a case of 6 here. Keep in a cool, dry, dark place. Serve chilled. The agricultural history of the Nardi family goes back to the early 20th century, when Giordano Nardi established an Azienda Agricola of vineyards, arable land and cattle breeding. In 1985 Ivo and Claudio 1961 founded Perlage S.R.L, which went on to be the first winery in Italy to make organic Spumante (sparkling white wine). Ivo became one of the pioneering members of the Associazione Suolo e Salute (Soil and Health), one of the first organisations dedicated to the development and regulation of organic farming. He is still an enthusiastic member and supporter. In 1981 the vineyards were officially reconverted to organic cultivation and vinification also took place under organic regulation.